A number of watch auctions took place in Geneva last week, Sotheby’s had one on Sunday the 14th and Christies on Monday the 15th. At least with the auction over at Sotheby’s on Monday, the world of collecting vintage Rolex watches has become a little bit crazier than it already was. 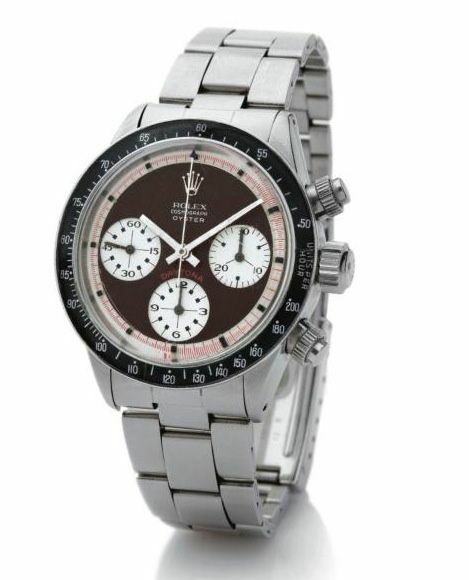 Estimated at 60,000 – 80,000 Swiss Francs, this ca.1969 Rolex Oyster Cosmograph Daytona ref.6239 with discolored brown dial was hammered at 464,500 CHF (which is $469,809.24 USD at the time of writing). A collector must have thought this Daytona was worth almost half a million dollars because of the discolored dial, the unusual dial print and the condition of the watch. The case and bracelet were (still) unpolished and therefore in original condition. As with all vintage Rolex Oyster Cosmos, the movement is far from being interesting (based on a Valjoux 72) but it is mainly about condition, rarity and whether a watch comes complete with box and papers or not. Personally, I really love this brown dial with white sub-dials and red printed minute markers on the outside of the dial. It is one of the nicest Daytona dial combinations out there. Like all vintage Daytona watches, this watch has a diameter of only 37mm. When you see a vintage Daytona for the first time, you might even overlook it when it is sitting in between its 40mm friends. More information about this Sotheby’s lot 104 can be found here. On the Vintage Rolex Forum, you can find a report on the Geneva auction with lots of pictures (click here).